Kenn was born in Beaver Dam, Wisconsin and spent much of his childhood on the family farm near Burnett, Wisconsin. His fondness for nature became the catalyst for his art. Kenn’s parents encouraged his artistic education and following High School, he attended Layton School of Art in Milwaukee,Wisconsin. After graduation from Layton in 1973, he embarked on his professional career in Design and Illustration. As a commercial designer and illustrator Kenn received many awards at both local and national levels, which included acceptance in the Annual Society of Illustrators Show in New York. 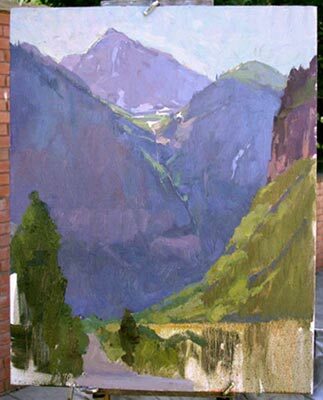 Although Kenn took pride in his commercial successes, his heart always belonged to the fine art of outdoor painting. 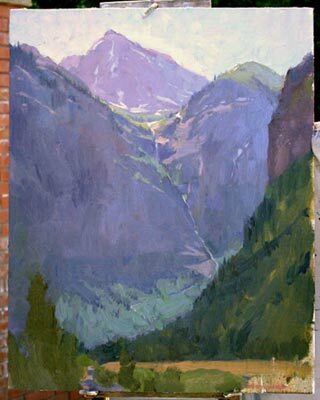 With developing interest in the historic Plein Air style of painting, Kenn decided in 1984, to devote more time to his passion for painting and the love of the outdoors. He found that capturing true color, value and the mood of a subject was best done on location or through direct observation. His passion for painting has broadened his subject matter to include not only landscape, but also figurative, portrait, still life and wildlife. Kenn’s works have been juried into many shows across the country, including the Oil Painters of America National Shows. His works have received many awards including the Collector’s Choice Award at the Seventh Annual Laguna Beach Plein Air Invitational 2005, Artist’s Choice Award at the First Annual Telluride Plein Air Exhibit and Sale, 2004, Fredix Artist Canvas Best Landscape award at the 2004 Oil Painters of America National Show, Kirkland, Washington, Tara Best Landscape award at the 2003 Oil Painters of America National Show, Taos, New Mexico, Second Place Award in the Crystal Cove Invitational Exhibition 2003, 1999 Finalist winner The Artist Magazine, a Best of Show in the 1999 Invitational American Plains Artist Show, Midland, Texas, Award of Excellence in the 1998 Regional Oil Painters of America Show, Arlington Heights, IL. 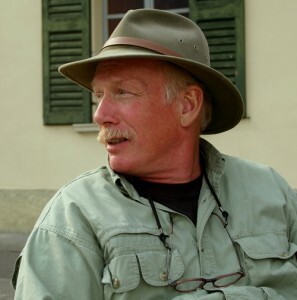 Kenn is a Master Signature member of the Oil Painters of America and a Signature member of the Plein Air Painters of America. 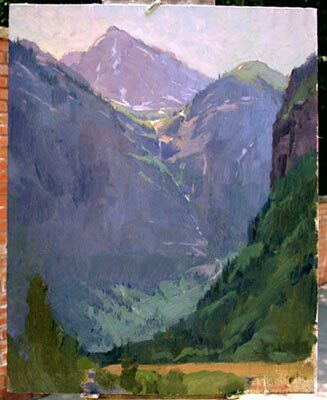 He also served as President of the Plein-Air Painters of America from the year 2000 through 2001. Kenn is one of fifty artists selected from across the country to participate in a traveling museum show titled “FROM SEA TO SHINING SEA”. The exhibit will open at the Haggin Museum, Stockton, CA in the Spring of 2004 and will travel across the country to various museums through 2006. The traveling exhibit is scheduled to conclude in 2006 at the Scottsdale Artists’ School in Scottsdale, AZ. I feel the artist has to have a goal in mind as to what this painting you are about to start, is going to say to the viewer. What attracted me to this scene is what I want to paint and that is the back-lit morning atmosphere, the depth and the scale of the waterfalls against the grandeur of this mountain. If you go back to the photo of the scene you will notice all the buildings and automobiles on the street. I felt all this additional information would be a conflict to what I wanted to say in this painting, so I will omit these elements from the painting. I have a variety of starts to my paintings. This start is very similar to a watercolor; it has a very transparent wash with the oil paint being thinned with mineral spirits. I just block in the basic shapes in their respective color families. 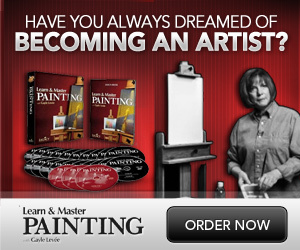 This is similar to drawing or sketching the composition on the canvas, here you are just applying the areas in masses. This second step, I start to set-up the relationship between the different mountain layers and the sky. I start to develop the farthest mountain area and the type of light and value compared with the closer mountains that are in shadow. This was very important because I knew that it would not take long and the sun would fill this scene with more light then what I was looking for. There is also a harmony to the whole scene, it will be important to develop this harmony in the painting. This step I expand more of the subtle transitions in the farthest mountain, developing some of the snow fields that lay on a shelf-like area where the stream starts. I also develop some of the subtle areas of the middle mountain as the light spills into this area. 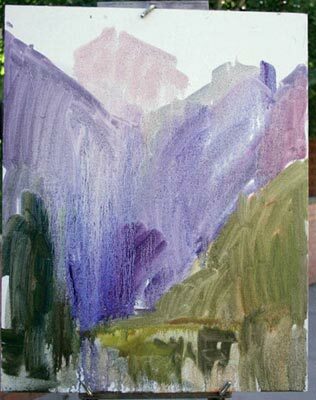 The foreground area is given some attention and I start to develop the closest mountain on the right side. This stage starts to show a change in the scene. A couple of clouds started to develop and at one point the clouds shaded the closest mountain. This made the effect of the backlit atmosphere of the scene even that much more appealing. 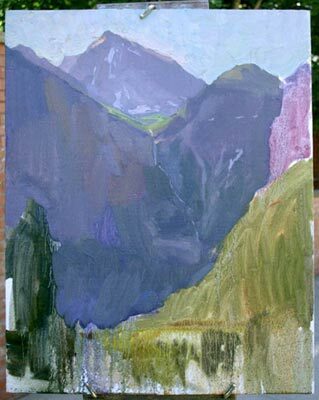 I quickly made the value shift in the mountain on the right side of the composition placing the whole thing in shadow. There is more development of the sky and the second mountain, showing a lost and found of the meandering stream and falls. I have also consciously lowered the horizontal field below the mountains. This gave the scene even that much more of a vertical feel. This stage shows some of the subtle developing of the closest mountain, the tree areas and the rock wall formation above the trees. Suggestion of tree formations and different planes within the various mountains going back into the scene are also further developed. The final stage includes addressing and making sure that the harmony that I spoke of earlier has been developed. The foreground area has to be worked on. I give a little more attention to the closer elements; the trees, the road and the suggestion of other foliage. The key word that I have used in these descriptive stages is suggestion. Every painting needs a focal point to direct the viewer. If you have too many focal points (areas with the same amount of detail) there becomes a competition between these elements. 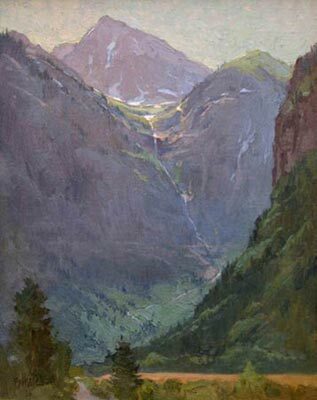 The artist needs to develop the focal point and then with design and the suggestion of other elements in the scene lead the view around through the painting. Excellent description of the stages of painting. It was great to see how you laid out the entire painting in stage 1 and developed it from there. Thank you! !